For several weeks, NJHS has been organizing an activity - FEBRUARY FRIENDZY - that will be held after school on February 7th until 5:05pm. Students may PREPURCHASE a $5 ticket between January 21st and January 24th for the event that includes pizza, drink, and 2 tickets to the the Pop and Cake Walk. Tickets purchased after the 24th will be $6 and that does not include 2 tickets to the Pop and Cake Walk. February Friendzy will be 6 consecutive 20 minute rotations with a 5 minute break in between each one. Activities in the classrooms are KARAOKE, MAFIA, DANCE CENTRAL, CHARADES, and MINUTE TO WIN IT! Students will rotate classrooms by grade and a group from each grade will go to the McCardinal Cafe for food, the Pop and Cake Walk, and Photo Booth. NJHS students will be in classrooms and will serve as directors of each activty. They hope that the students at CMS enjoy FEBRUARY FRIENDZY! benefits the Leukemia and Lymphoma Society. We hope that by having competitions between grades and gender, we can help support the children and families that are faced with these diseases. will be donated to Pennies for Patients. 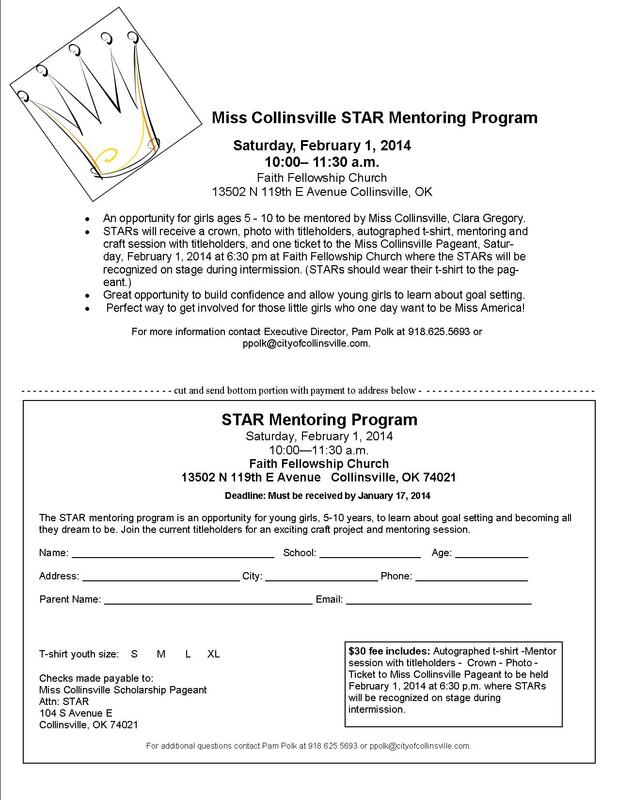 Collinsville, OK The STARs Mentoring Program is a national program of the Miss America Organization, which has been brought to the local level by the Miss Collinsville Scholarship Pageant. The STARs Mentoring Program is for young girls age 5-10 years old. 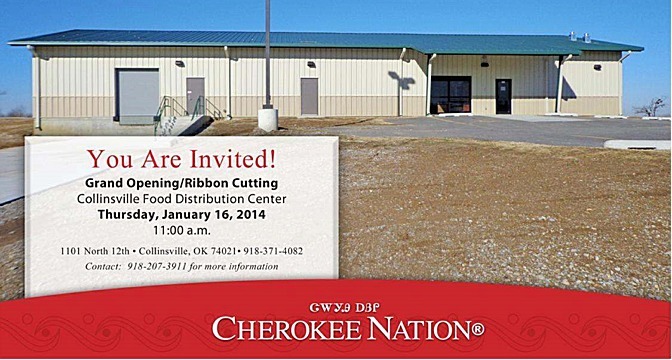 The program will take place on Saturday, February 1, 2014 from 10:00 a.m.-11:30 p.m. at Faith Fellowship Church, located at 13502 N. 119th E. Ave. in Collinsville, Ok.
Young girls will have the opportunity to attend a workshop and learn about achieving your dreams and building self-confidence. They will also receive an autographed t-shirt and a photo with Clara Gregory, Miss Collinsville 2013. Participants will also create a special craft with the titleholder and will receive a FREE ticket to the Miss Collinsville pageant to be held that evening at 6:30 p.m. at Faith Fellowship Church where they will be recognized on stage and will be crowned Miss Collinsville Stars. Registration is required for the program so that each child will receive a t-shirt. Cost to attend the program is $30 and all proceeds go toward scholarships and assistance for the 2014 titleholders who will be crowned during the Miss Collinsville Pageant. If your child is interested in participating in the STARs Mentoring Program email ppolk@cityofcollinsville.com or call 918.625.5693. Deadline to register for the program is January 17, 2014. Luncheon following in the Victory Cherokee Org. bldg 11:30a.m. with a focus on Tulsa County. and made one felony arrest for selling liquor to a minor. remained free of injury collisions while executing this plan. Thank you and please have a safe and happy New Year!